YoYo Casino has returned with another excellent tournament this week, and you are welcome to join as soon as you register and open an account. This one will be especially hot – all thanks to the featured game: Volcano Riches. Explore the rich playground and some of the hottest bonuses, with the Volcano Riches slot that is going to enable new ways to unlock some extra points. It's Slot of the Week tournament, so head to the Yo Yo Casino and opt in by placing bets at the minimum of 0.30 EUR, which should be enough to take a spin and have a lot of fun. YoYo is giving away a total of 100,000 Loyalty Points, which you can later exchange for some bonus prizes. Specific terms and conditions are available alongside other details regarding each online casino tournament individually. Rest assured, that this will be a truly safe and incredibly satisfying experience, full of surprises and additional goodies. 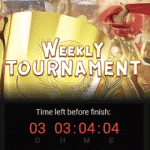 You can qualify and enter this Slot of the Week tournament, which runs at Yo Yo between the 21st and 25th May, by entering via the promotional webpage. This should be perfect for anybody who is still new to all this gambling action, and the following casino is as user friendly as they get, making it so much easier to enjoy the various special privileges and bonus rewards. Total prize pool: 100,000 L.P.